The time is out of joint. O cursèd spite / That ever I was born to set it right! There are some stories which appear over and over again, around the world, under different names and with different details, but always, at base, the same. Universal. These stories, however, are short, authorless, moral. Stories told to children, with simple meanings. Stories that originated in different parts of the world at different times to tell simple, human truths. But these are not the only kinds of universal stories in the world. There is another, rarer kind. The kind that originates in one place, the product of a specific time, and still tells the story of humanity. Shakespeare’s Hamlet is one of these. Hamlet’s true universality lies in its adaptability. True, Hamlet is not universal in the sense that everyone around the world understands it in exactly the same way, but it is universal in perhaps a more powerful way: it is a story with so many facets and possible interpretations that any culture can latch onto it and find meaning relevant to their circumstances. It is for this reason that Hamlet has never faded away into the dust of history and, I believe, never will. There are many ways in which to interpret Hamlet, but one of the most common is politically. With globalization, Hamlet made its way slowly, but surely, around the world, touching culture after culture, and culture after culture accepted it and made it its own—more often than not with politics in mind. In this way, Hamlet has become politicized, acting as a vehicle for political movements all over the world, from Japan to the Middle East. And, no matter how different the messages tacked onto it, Hamlet never ceases to be Hamlet, instead growing stronger with each reinterpretation, ensuring its own survival. In this paper, I intend to discuss two examples of politicizations of Hamlet: one, the Japanese film The Bad Sleep Well, and the other, the Middle Eastern play The Al-Hamlet Summit. Both seek to convey political messages via reinterpretation of Hamlet, changing and adopting various parts of the story to suit their different needs and thereby both ensuring the existence of their message and the continuation of Hamlet’s. 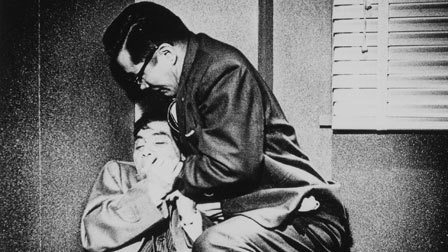 When The Bad Sleep Well was released in 1960, Japan was struggling with its national identity. World War II had ended fifteen years earlier, leaving the Japanese with a new democratic constitution, an inundation of Western culture, and more than a few American soldiers. Unsurprisingly, tensions ran high during those fifteen years as struggles between traditional Japanese values of conformity and the more modern, democratic ideal of individuality raged, helped along by a tremendous influx of ideas from all over the world. Japan diversified immensely during the ’50’s, something optimally illustrated by the films that began to flow out of Japan, including, perhaps most memorably, the highly Western-influenced Godzilla (1954). By 1960, Japan was a country still struggling to come to terms with its newly-gained democracy and all that came with it and the 1960 revision to the already unpopular and controversial U.S.-Japan Security Treaty added fuel to the fire and triggered much protest in Japan. Among other things, the treaty allowed far more power to corporations than had existed in the ’50’s, which many Japanese felt was counterintuitive to their postwar constitution, which had granted democracy and equal rights to all. There was fear that increased power to corporations would reverse the trend towards individuality begun by the new constitution and rob Japan of much of its still-newly-gained democracy. Japanese citizens were generally unhappy with what they saw as corporate excesses and the lack of regard corporations held for the consumer. Such was the political climate when Kurisowa’s The Bad Sleep Well hit theaters in 1960, billed not as a reinterpretation of Hamlet, but as more of a tribute to Western detective and “noir” films of the ’30’s. The movie has its roots in Shakespeare’s Hamlet, though its is not a Hamlet which is immediately recognizable. Gone is the inactive, wavering, voluble prince of Shakespeare’s work. He is replaced by the suave, vindictive, reticent, and entirely active Nishi, who is, like Hamlet, obsessed with achieving revenge for the murder of his father, though Nishi’s father suffered no poison in the ear, but rather was forced to commit suicide to protect his superiors. When the film begins, Nishi is already very far along in executing his plans for revenge, having assumed a new identity, procured a job with Public Corporation (the company his father worked for), and managed to get engaged to the daughter of the company’s vice-president, who had a direct hand in his father’s death. In Kurosawa’s film, the conflict is no longer internal, as it was in Shakespeare’s play, but external, and entirely political. Kurosawa’s Hamlet seeks justice, both in his quest to avenge his father, but also in his attempt to expose the corruption in both Dairyu Construction and Public Corporation, and as such, he is a hero in the usual sense: we, as the audience, can sympathize with his motives entirely as he is the everyman standing up to the great, corporate giant as he looks to bring justice to the world. Shakespeare’s Hamlet knows nothing of justice beyond the avenging of his father’s death; he gives not one thought to the kingdom or the people. On the contrary, he is willing to upset justice further by killing innocents to further his attempt at revenge, ending the play with his kill count at five, as opposed to Claudius’ one. Nishi, on the other hand, kills no one. The Bad Sleep Well is not about Nishi in the way that Hamlet is about Hamlet. It is telling that Kurosawa’s title is not Nishi, but instead a reference to corruption and the ease with which it goes undetected. Furthermore, there were no mentions of the connection to Hamlet preceding the movie’s release. As a result, moviegoers would not have gone to see this film with revenge—the driving force and main issue of Shakespeare’s Hamlet—in mind, but instead would have expected commentary on good, evil, and justice. Which is exactly what they got. Japan in 1960 did not need an examination of the morality of revenge. It needed help sorting out issues of identity, corruption, and individuality, all of which Kurosawa addresses in the film. Hamlet provided a tableau to address the political problems posed to Japan by corporate power and corruption, problems which are not even remotely addressed in Shakespeare’s text and it is testament to Hamlet’s universality and complexity that Kurosawa manages to pull it off. It is not that the problems that Kurosawa addresses did not exist in Shakespeare’s day—of course they did, they are simply not Shakespeare’s focus in Hamlet; they’ve been ousted to the periphery. With The Bad Sleep Well, it is as if Kurosawa has simply zoomed in on a different aspect of the story, namely corruption. In Hamlet, we never really hear what the people of Denmark think about what’s going on at Elsinore. They’ve lost their king and—somewhat suspiciously—it is now his brother who holds the throne, rather than his of-age son. Furthermore, their country is threatened by the army of young Fortinbras and not much is being done about it. By the end of the play, their new king, old queen, and prince are all dead and they’ve suddenly come under the leadership of the very Fortinbras who threatened them not an act earlier. The people of Denmark have been trampled and no one in the play cares because they are common people and mean nothing in comparison to the aristocracy. In The Bad Sleep Well, we get the story from the other perspective: the little people who are being trampled upon. For Kurosawa, royalty become corporations (the modern-day equivalent of royalty) and the prince becomes a common hero. Kurosawa has removed Hamlet from “royalty,” as it were, for it would not do for his hero to be of the very thing he is fighting. Instead, Nishi has married into the corporation as part of his plan; Claudius is not his uncle and step-father, but his father-in-law, as Nishi has married Yoshiko. This subtle shift allows Nishi to take on the heroic status Hamlet never can, drawing the sympathies of his audience to the plight of the every man oppressed by large corporations behaving as if they’re royalty. This story, which differs not overmuch from Shakespeare’s Hamlet, bears far more pertinence to the political situation in 1960 Japan than the original play’s text and allowed Kurosawa to make a statement against increased corporate power and the loss of the individual. Kurosawa’s reapplication of Hamlet to postwar Japan proves that Hamlet truly is universal, but only because it possesses so many nuances that there are near infinite ways to interpret the story, allowing it to become a constant and malleable story for the world. Now, fast forward forty-six years. Completely different part of the world, completely different situation. Same old Hamlet. Except he’s an Islamic fundamentalist. This is the premise of Suleyman Al-Bassam’s The Al-Hamlet Summit. Hamlet’s history in the Middle East has, according to Hamlet professor Margaret Litvin, been more than usually tied to politics. Compared to other parts of the world, Hamlet came to the Middle East relatively late, first appearing in musical comedy form in the 1890’s, having been translated from the French. It existed in various forms between the 1890’s and 1922, when it was translated from the English into Arabic for the first time. For this reason, the Arab take on Hamlet is an especially global one; Litvin calls it the “global kaleidoscope” through which the Arab world views Hamlet. Following the 1952 Egyptian Revolution, theater’s purpose in the Middle East changed from entertainment to political posturing and suddenly Hamlet took on the triumphant role of a freedom fighter, reflecting the area’s political leanings. However, after Egypt’s loss in the Six Day War in 1967 and President Nasser’s death in 1970, Egyptian versions of Hamlet experienced a dramatic shift toward a Hamlet paralyzed by inaction and despair, reflecting the people’s mood. During this period, performances of Hamlet also served the purpose of putting the Arab world back on the map, as it were; Hamlet serving as a kind of test where, if your country could interpret the play successfully for itself, then it deserved to exist. However, all that stopped in the mid 1970’s when Hamlet became an archetypal Arab hero who served to criticize corrupt governments and the lack of democracy in the Middle East. This Hamlet was a revolutionary, hearkening back to the one of the ’50’s. After the ’70’s, though, irony returned to Arab productions of Hamlet and he became archetypal of Arab humor, used to satirize politics. This brings us up to 2006, when Kuwaiti playwright Suleyman Al-Bassam penned The Al-Hamlet Summit. The Al-Hamlet Summit transplants Hamlet into the modern day Middle East and seeks to address the issues plaguing the area today. Hamlet’s father, the king, has just died and been replaced by his Westernized brother, who has also married Hamlet’s mother. Instead of a ghost to plant the idea that his father was murdered by Claudius, there is the People’s Liberation Brigade, which prints and distributes fliers accusing Claudius of pouring sodium nitrate in his brother’s ear in order to further his own ends (i.e. become a dictator). Instead of a sweet, innocent Ophelia driven to madness, there is a savvy Ophelia who turns suicide bomber by the end. There is an added character in the Arms Dealer (who may or may not be American), who goes from character to character, inciting one against the other, and providing the weapons for war. Fortinbras, with his army of tanks, approaches the borders of the country. Claudius prays not to the Christian God, but to a suitcase full of petro-dollars. Hamlet’s insurgency threatens his uncle’s regime. The language is that of modern day Middle Eastern political rhetoric (Claudius even quotes Saddam Hussein at one point). What Al-Bassam has done is create a play which furiously examines the situation in the Middle East and its causes, almost seeming a parody at times, due to the extremity of its language and images. Again, in The Al-Hamlet Summit, the focus is no longer really on Hamlet himself. Beyond the fact that he is a radical, hearkening back to those of ’50’s Middle Eastern Hamlet productions, Hamlet is unimportant to Al-Bassam’s message. Instead, the play becomes about Claudius—the dictator who literally worships money—and the Arms Dealer, who controls him. Claudius himself is merely a puppet of the Arms Dealer, who represents, to Al-Bassam, the problems for the Middle East. As Litvin says in her book Hamlet’s Arab Journey, “Al-Bassam’s audacity lies not in casting an Arab leader as Claudius but in casting the United Staes as God” (Litvin 178). Al-Bassam does not seek with The Al-Hamlet Summit to state general political truths, but instead to illuminate very specific ways of thought, very much reliant on their cultural atmosphere. The play challenges democracy in the character of the Arms Dealer (who certainly represents America, if she is not American), pointing out that perhaps democracy is not enough. It certainly isn’t from the point of view Al-Bassam examines in the play; in fact, it is most likely the culprit, sitting haughtily above, playing God, as all the Arab nations battle it out with weapons sold by the Arms Dealer. None of this is to say that Al-Bassam has entirely lost Shakespeare’s original text. Al-Bassam’s play draws many subtle parallels between Shakespeare’s world of vice and conspiracies, feud and rhetoric and the modern Middle East, despite the immense difference in language. Like Kurosawa, Al-Bassam draws on specific, small facets of the Hamlet story that are left unexplored by Shakespeare and brings them out, reinterpreting them so that they suit his particular situation. 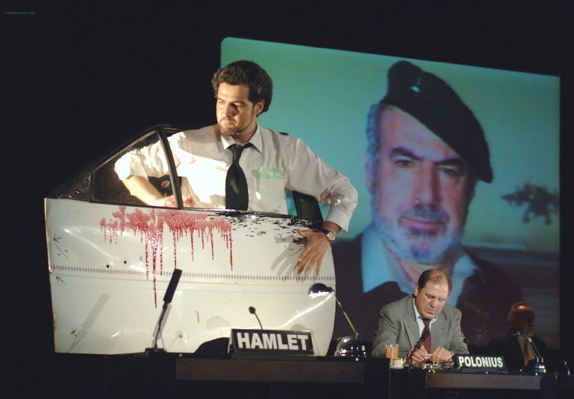 Following in the long line of Arab adaptations of Hamlet being used as vehicles of political thought, The Al-Hamlet Summit does much in the way of conveying Al-Bassam’s political opinions, particularly considering the fact that it was first performed in Britain, for a Western audience. This drives home his questions regarding the West, democracy, and America, increasing the importance of the character of the Arms Dealer, and leaving his audience to ponder how else the play could have ended, how the cycle could have been stopped. Shakespeare’s Hamlet transcends all boundaries. From England to Japan to China to America to the Middle East to the jungles of Africa, Hamlet has made its mark, and each time its mark has been different. Its universality relies on its adaptability. A Japanese person and a Middle eastern one might see entirely different things when they read Hamlet, but in the end it is still Hamlet and it will always be Hamlet so long as people continue to reinterpret it. Hamlet’s politicization is a part of that reinterpretation: people using the familiar framework to create new points that will only increase Hamlet’s time on the world stage. Al-Bassam, Sulayman. The Al-Hamlet Summit. Hatfield: U of Hertfordshire P, 2006. Print. Kurosawa, Akira, dir. The Bad Sleep Well. 1960. Film. Litvin, Margaret. Hamlet’s Arab Journey. Princeton: Princeton University Press, 2011. Print. Litvin, Margaret. “Shakespeare’s Hamlet and the Anxieties of Arab Nationalism.” Cornell University. Speech. Shakespeare, William. Hamlet. New York: Simon & Schuster, 1992. Print.